Ol Doinyo Lengai, the 'holy Maasai' mountain is an active cone shaped volcano, surrounded by multiple small craters near the Ngorongoro Highlands and Lake Natron. Lake Natron is a natural salt and soda lake and attracts an abundance of birdlife including thousands of flamingos. After breakfast, we depart Arusha for the 5 hour drive to Engaresoo Village near Lake Natron. Mt Meru lies in the heart of Arusha National Park, an area of outstanding beauty encompassing a wide variety of habitats and teeming with a magnificent array of animals including elephants, giraffes, hippos, buffalo, zebra, antelope, blue monkeys, black and white Colombus monkeys, hyenas and even the elusive leopard. We leave the Miriakamba hut after breakfast and walk along flat land before entering the Montane forest. We continue hiking until we reach a brief opening in the woods called Elephant Ridge before arriving at Saddle Hut. The normal cloud cover of Arusha National Park burns off at about 3,200 meters, with Saddle Hut sitting at 3,570 meters, we will be able to take in the views above the clouds. After a light breakfast at midnight, we begin the hike to Mount Meru's summit, Socialist Peak. We start with a steep climb up to Rhino Point (3,800m), descending to cross a small rock bridge, and then continue going up and down over the mix of rocky and sandy trail. The trail involves rock scrambling and there are steep drops to either side of the trail in some places. We reach the crater rim around sunrise and continue to Meru’s peak. The views are spectacular all the way to the summit, offering a close look at the crater's sheer walls, the ash cone, cloud formations and the surrounding park. Spend the day at leisure, rest & relax at the hotel before the last of your three peaks, Mt Kilimanjaro. Or why not arrange an optional excursion to visit Ngorongoro Crater for the day. Contact us for details. Our route continues up into the forest and as we gain altitude we continue to notice a change in the vegetation. Today’s trek includes several uphill sections and there are several viewpoints from which we can see the plains and forests below and Kibo and Mawenzi peaks above. Although this up and down day ends with an elevation gain of only 110 metres, by early afternoon you will have climbed 690 metres to a height of 4,530 metres before beginning your descent to Barranco Camp. This day is crucial for acclimatisation. After breakfast, we hike east on the Shira Plateau before reaching the junction for the Shira and Lemosho Routes. We continue on through the barren landscape before stopping for lunch at the highest point of the day, Lava Tower, a 300ft lava formation jutting out of the mountainside, before descending quickly to Barranco Camp. We leave Barranco Camp after an early breakfast to begin the hike to Barafu Camp. The day begins with an hour and a half scramble up the Barranco Wall, which forms probably the hardest part of the day and in some places you will have to use your hands to pull your body up. On reaching the top, you will make a short descent into the greener Karanga Valley before continuing on to Barafu Camp. As we make our way to Barafu, we will have the opportunity to view several of Kibo’s glaciers as well as the junction that connects the descent route, Mweka, with the Machame trail. During the day we will hike by the Heim, Kersten and Decken Glaciers for some amazing camera opportunities. 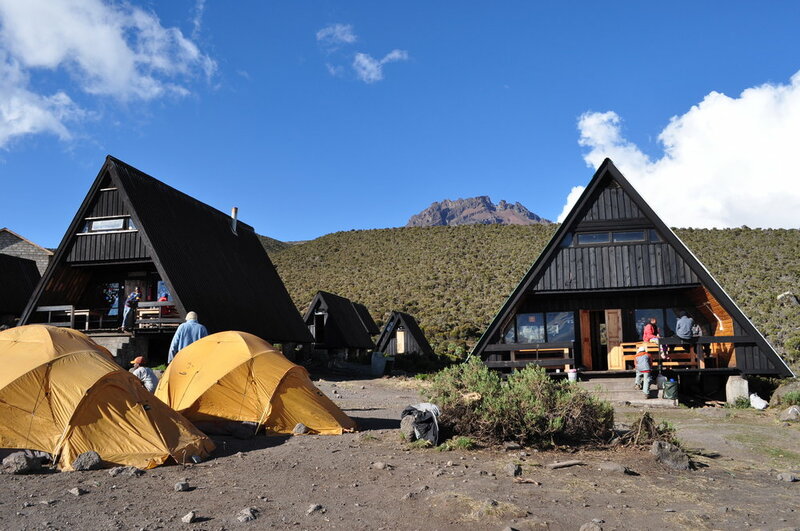 Though the trail to Barafu passes through an alpine desert with often very little vegetation, Barafu Camp offers stunning views of Kibo and Mawenzi peaks. This is it, what we’ve all been working up towards! At around midnight, we begin the final ascent to Uhuru Peak, the highest point in Africa. For the next six hours, we will be hiking by the light of your headlamp. The ascent to the crater rim is the most challenging part of the entire trek as the trail is very steep until you reach the crater rim at Stella Point around dawn. Watch an amazing sunrise as we continue climbing more gradually from Stella Point to Uhuru Peak. On reaching the summit of Africa, take a moment to take in the stunning views of the mountains, crater, clouds and glaciers, take some photos and reflect with pride on what you’ve achieved over the last two weeks. We then start our descent via the scree to Mweka Camp via Barafu Ridge where we will stop for breakfast and a short break. Take a very well deserved rest overnight before we are on the home stretch tomorrow. After breakfast, we finish the trek with a descent to Mweka Gate. Your last hike on Kilimanjaro is a beautiful one, passing through Kilimanjaro’s cloud forest. Watch your step during the descent, as the trail can be slippery. Reaching the gate you can look forward to your certificate and a celebratory Kilimanjaro beer or two. Along the way we will stop for some local lunch before heading back to our hotel in Arusha. Today is our last day and group transfers will be available to take you back to Kilimanjaro International Airport. You are of course more than welcome to extend your stay with us after your challenge. Safaris and excursions can be arranged. Please contact us for details. *Itinerary is indicative and may be subject to some small changes. Hiking times are also approximate and will depend on the group. Cancellations: We strongly suggest that you take out trip cancellation/travel insurance. Due to our small size, cancellations affect us greatly. Trips cancelled between 90 and 65 days prior to the expedition start date will incur a 25% cancellation fee. 50% of the total expedition price will be charged for cancellations between 64 and 30 days. No portion of the total expedition price will be reimbursed for cancellations within 30 days of the trip start date. Discounts on future trips: Provided the trip is cancelled more than 90 days before the start date, the £250 deposit may be applied to a future trip if booked within 365 days, at the discretion of the company. Final Payments: Final balances are due 90 days prior to the trip start date. The deposit for this trip is £250.